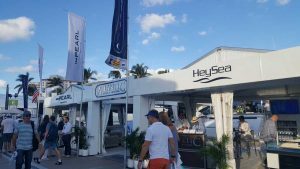 Day 1 at the 2017 Fort Lauderdale International Boat Show : Atlantic Yacht & Ship, Inc. The 2017 Fort Lauderdale International Boat Show is all ahead full and if you are in the market for a quality used motor yacht for sale, be sure to come and visit us at the 2017 Fort Lauderdale International Boat Show. In the first place, Fort Lauderdale, Florida is known as the “Yachting Capital of the World”. Here will be the 58th annual 2017 Fort Lauderdale International Boat Show on Nov 1-Nov 5, 2017. After all, the show exhibits range from yacht builders and designers to exotic cars and brokerage yachts. Overall, a wide variety of boats will be on display including the motor yachts we have on display. This is exactly where you want to be! This year, this 2017 Fort Lauderdale International Boat Show will feature an instructional powerboat school. Nothing beats hands on experience when it comes to improving your boating skills and learning new ones. This year add more fun and excitement to your boat show experience and take your boating skills up a notch. There’s something for everyone – from absolute beginners to seasoned skippers! If you get winded from all the walking, Mobility Scooters Direct is here renting out mobility scooters! In addition to us debuting the all new 80′ Pearl Yacht we will have at our display: the new 65′ Pearl Yacht, the 133′ IAG 2016, a 116′ Lazzara 2008, a 100′ Hatteras 2002, a 96′ Hargrave with an elevator, a 88′ Sunseeker 2010, a 82′ Monte Fino, a 75′ Hatteras, a 68′ Cheoy Lee, the very special 55′ Zeelander along with a 44′ Zeelander, and three different Vanquish yachts. So if you are coming by the 2017 Fort Lauderdale International Boat Show be sure to stop by and say hi at our display! Contact your favorite AYS broker for special access! Come see us at our display at this year’s 2017 Fort Lauderdale Boat show!